ART, I can I suppose be considered by some an authority on Art, so I was delighted to find this wonderful region by Alizarin Goldflake. Acquarella: After the Apocalypse, Opened in October 2011. 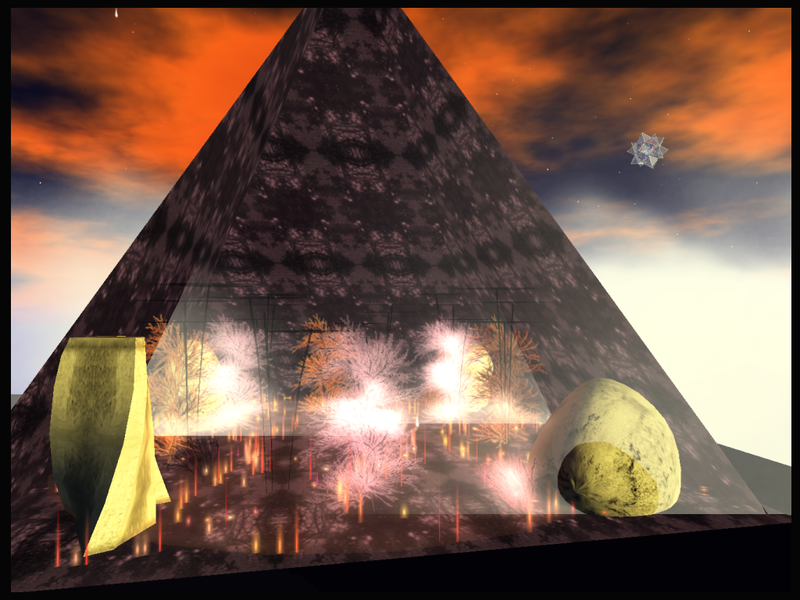 On The Acquarella Sim can be found, "Requiem for Fukushima" it is a dramatic build of sinister beauty commemorating the Fukushima diaster in Japan. Housed inside an iconic pyramid shell, it contains strangely-glowing plants, flames, billowing smoke, and burning cinders amid the coastal rocks. This is a joy to find, Alizarin has created a superb installation of Kinetic Sculptures and Immersive Art. Try changing your Windlight settings and explore. It is quite breath taking, please take sometime to have a look you will be blown away.